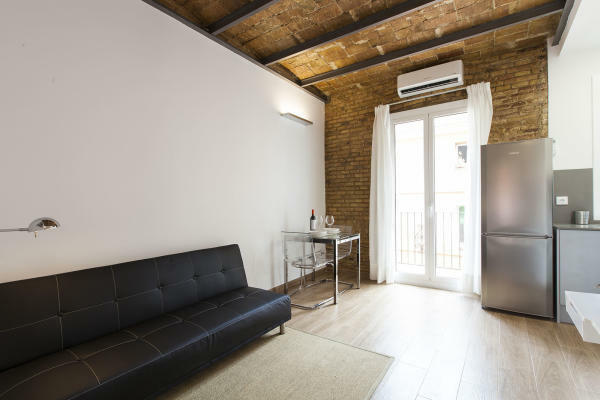 This modern 1 bedroom apartment is located in the lovely Barceloneta neighbourhood, just minutes from the beach and just a short walk to the centre of Barcelona. This lovely apartment has one double bed and can accommodate up to two people. The bedroom leads out onto a private terrace overlooking a typical Barceloneta street, with seating for two people. The bright living room is home to a large sofa as well as a TV and Internet connection. The kitchen comes equipped with a hob cooker, microwave and any equipment you may need to cook your favourite meals. This apartment also comes complete with heaters and air conditioning, making it an ideal living space all year round.